What is a tragic character study comes to light slowly in David Rosenthal's A Single Shot. 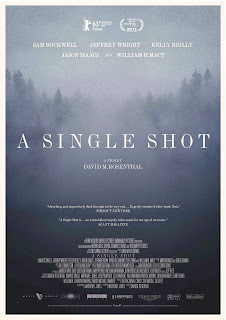 With its southern gothic tones that nearly dip their toes into the horror genre at certain points we tread lightly along with lead character John Moon (Sam Rockwell) as he sulks through the woods that provide the backdrop to his now barren trailer where he lives and waits, pointlessly, for the return of his wife and son. I have yet to see any previous directorial efforts by Rosenthal prior to his latest, but it is clear he has a gift for being able to access the inner-workings of his characters minds and translate them to the screen without resorting to over-indulgent tactics that exclude some audience members. Either that or he was extremely lucky to land someone as versatile and gifted as Rockwell to play his lead character that starts his journey as a man desperate for normality without the intelligence to see what it might actually take to get back to that point. We are subjected to Moon's journey as things only begin to unravel. As the title suggests, a single shot sets off a chain reaction of cat and mouse that allows the film to become much more generic than its tone and prestigious cast would indicate. The nearly two hour film moves at a somnolent pace and doesn't return to the surprising or poignant place it began in until its final scene where, miraculously, we are provided with a genuine emotional payoff that I didn't see coming. That final scene made me want to re-consider my overall opinion of the film, but as I thought through the piece as a whole it seemed too much an intriguing start and perfectly balanced conclusion with a messy middle that comfortably fell into conventions rather than a film who had the nerve to stick with its protagonist and trust that his psyche alone was worth following. There are films that make you question what exactly you're looking for in them and when you have to ask that question it usually means there is no clear objective or that the film itself isn't sure what it wants to be. That is the vibe that comes from A Single Shot as I could see that it wanted to be a dark and brooding story from the untold diaries of backwoods Appalachia, but it didn't necessarily know where to go to accomplish that and so instead became a familiar thriller with the saving grace of Sam Rockwell at its center. 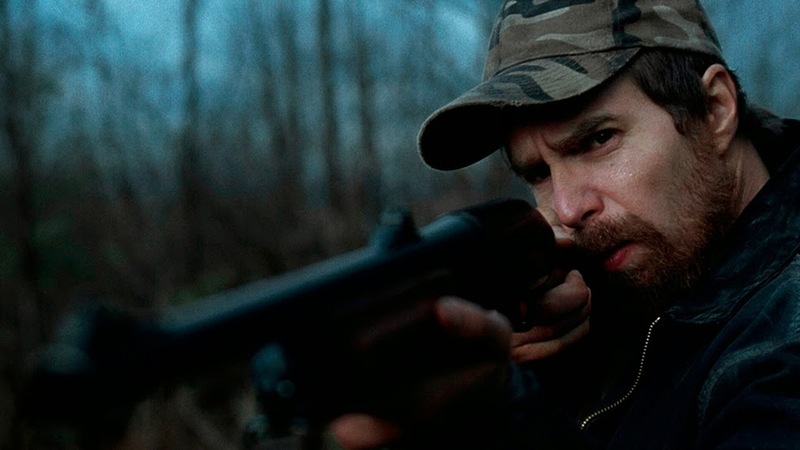 John Moon's (Sam Rockwell) single shot forever alters his life. The aforementioned single shot is one that John lets rip thinking he is shooting at a deer but comes to find out it is a young girl who he has fatally hit and as he doesn't know where she came from or who she is, but that she has a box filled with money laying right next to her he decides to take the road less traveled. John is in a bit of a rough patch at this juncture of his life and so he decides it best to hide the body and take the cash. This way, he can at least go into town and hire a low rent lawyer (William H. Macy) who might help him in his legal battles against his wife, Jess (Kelly Reilly of Flight), who really wants a divorce. John isn't interested in getting a divorce as more than anything he seems to want to retain what he and Jess once had before the birth of their son, Nolan. Obviously, things begin to get a little strange for John as you can't simply kill someone and expect for there to be no repercussions, though I did get the sense John slightly hoped for and expected that. John heads down to meet with Macy's cheap lawyer, Daggard Pitt, at the suggestion of his friend Simon (Jeffrey Wright) who advises him to let him take care of things with Jess while alluding to the fact he knows more than John is comfortable with. In the process of attempting to reunite with Jess and his son he comes across Obadiah (Joe Anderson) a man whom John immediately doesn't trust and is friends with a mysterious new guy in town named Waylon (Jason Isaacs). It is when the film falls into the drenches of what Obadiah and Waylon are up to that it becomes little more than a cliche-ridden thriller that pits money over lives and shoot-outs over the weight each character should carry. There is a particularly brutal scene near the end that jolts you out of the doldrums of where you thought this movie was heading, but it is really too little too late as we've already resigned to the fact we know where the film is going and are still rather upset that the mystery and almost supernatural elements that surrounded the opening sequence didn't pan out to be more than this. While the film isn't able to become a coherent piece of storytelling by layering in all the elements of John's life that are seemingly coming to a head in these moments what it does do is feature a stellar performance from Rockwell. The guy is undeniably one of the best and most underrated actors working today. Simply by looking at his output this year alone you would be able to see what a diverse talent he is and how he is unmatched in being able to hone in on what makes the characters he plays tick and emote that perfectly to the audience. Though his story may be muddled and everything going on around him might seem a little too outlandish or on the contrary, even predictable there is no debating that we get to know who John Moon really is. As he did earlier this summer in The Way, Way Back playing an emotionally stagnant adult who couldn't adjust to the passing of time he again shows how well he is able to tune into the emotional stage his character is currently at and deliver on what we need to know about this person that will inform the decisions he eventually makes. In this character arc it all seems to make sense. As I said earlier, these are not intelligent people we are dealing with, they are hopeless wanderers simply grasping at straws for something that might improve their lives in the slightest. This is especially true with John who has seen his world crumble around him and only spends his days hunting as some attempt to have control over an aspect of his future. His fathers farm has been lost and he knows no other lifestyle, his wife has gone and he knows no other partner. Hunting is the one area he still has for himself, but when that is interrupted by the unintentional tragedy he falls upon he can only see himself going further down the rabbit hole in hopes that at some point there may shine a light. It is unfortunate because for as much as the plot wanders and stalls, Rockwell's performance never seems to lose its way but instead permeates the sense of isolation and paranoia better than the convoluted plot points could ever hope to. Daggard Pitt (William H. Macy) is in over his head in A Single Shot. Rockwell is joined in his subdued yet clearly exceptional performance by Jeffrey Wright who turns a drunkard into more than just a rambler, but someone who we recognize as a kind of tragic prophet spewing cautionary tales every time he sparks up a conversation with his only friend. 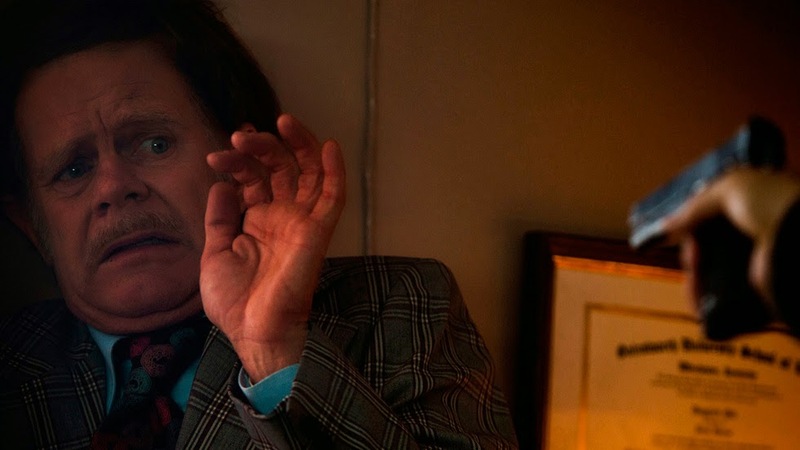 Wright's voice has always been a source of pain and heartbreak and he uses his unique tone to his advantage here by allowing us to become enveloped in a character that we might otherwise dismiss. Besides these two though, the rest of the talented cast is given little to do. Reilly who seems to be nabbing some pretty impressive roles and was one of the better surprises about Flight is clearly a gifted actress, but her ex-wife is so thin here we don't see her as anything more than something else that is pulling John down when he should be walking the other way. The same could be said for Isaacs as he made a career out of playing evil in the Harry Potter films but is given zero opportunity to let that devious side fly here. Rosenthal, along with cinematographer Eduard Grau (A Single Man, Buried) create a great atmosphere and barren tone that give the film an overall sense of dread and despair, but the narrative leaves us feeling empty and this is clearly a story that should have some kind of impact. The characters are what leave us with something to discuss and as I stated earlier, it is that final scene where the script finally finds its footing and delivers something more than just the characteristics of John, but the circumstances around him that resonate with an audience in a delicately complex and more understated way than anything else in the film. I wanted to like the film more than I did as I have a real love for these kinds of films that attempt to authentically represent the south and the simple lifestyles of those not fully connected with the world in the bigger sense of the word, but while A Single Shot certainly owes its poetic nature and ominous tone to films like Winter's Bone and That Evening Sun, it never consistently grabbed me as those films did and left me with more of a sympathy for the character of John Moon rather than an idea of why he needed such a thing.